Castle Dark - the annual Halloween attraction at Castle Park in Riverside - opens this weekend. 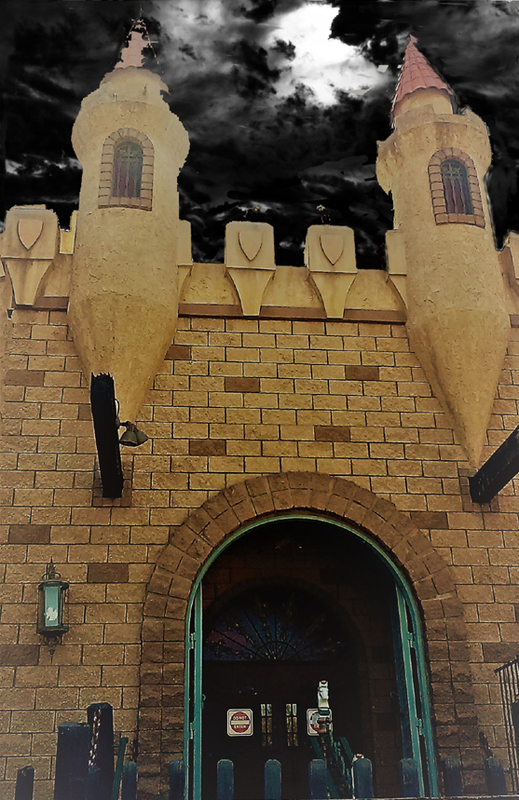 The event has been around for many years (Figment Foundry's excellent Chambers of the Mausoleum used to be located there before moving to Coffin Creek); however, Castle Dark has always maintained a lower profile than the more famous Halloween Theme Parks. Rather like Six Flags Magic Mountain Fright Fest, Castle Dark offers the park's year-round rides and attractions (arcades, miniature golf, merry-go-rounds, and a log ride) along with an overlay of seasonal decorations and attractions - the usual fun, plus a dose of Halloween horror. Castle Dark 2017 is boosting the setting on the PKE meter, with a new virtual reality haunted house attraction, Ghost Manor (by Modal VR). This allows brave soul to take a simulated walk through a computer-generated mansion, with visuals, sounds, and special effects that would be difficult if not impossible to recreate live. Hollywood Gothique attended Castle Dark's media presentation on Friday morning. By daylight, the Halloween mazes and decorations at Castle Park do not seem particularly ominous, but the park's castle theme and dragon mascot certainly suggest an imaginative fantasy land where legions of lost souls might propagate. The focus on press day was Ghost Manor, which had a "soft launch" the previous weekend, sans promotion, to gauge its effectiveness on park visitors. We learned that the VR experience had been intended to work for Castle Dark's target audience, including children as young as eight, but after several terrified reactions, the age limit has been bumped up to 12. A short video, viewed while waiting in line, acclimates newbies to the virtual reality experience, warning them not to run and assuring them that trained attendants are always nearby to help in case of vertigo. The event takes place in a space about the size of a modest dance floor, cleared of any obstructions. Participants wear a set of 3D goggles and stereo headphones, which combine to eclipse the real world, replacing it with the virtual simulation. A floating lantern leads the way, pausing in various rooms while an ominous voice intones warnings about the spirits haunting the premises. 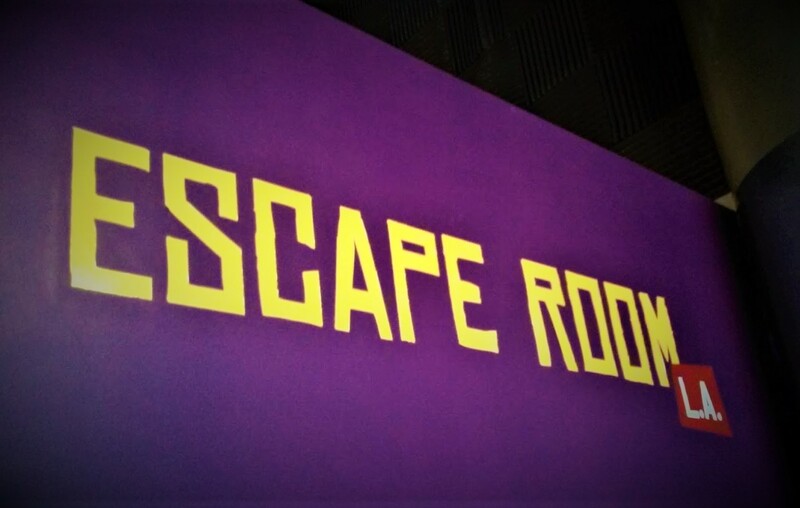 There is one scare per room, which is triggered when the participant looks in the right direction; then the lamp leads to the next room. The walk takes approximately five minutes, depending on each individual's pace. The journey is timed: pause too long after the scare, and a written message will eventually flash a reminder to follow the lantern. There are also messages and arrows to point visitors back in the right direction if they wander off course. We walked "through" Ghost Manor twice. It did not take much time to adjust to the virtual reality experience, but we did find ourselves so immersed the 360-degree simulation that we were afraid of not seeing everything. The look is not photo-real; it more resembles very good computer game graphics. Our favorite "location" was not a room but an exterior space (pictured at top), with high walls and a spooky night sky that made us want to linger and savor every detail. We found the scares mostly mild, but there is one truly intense shocker at the ending (which probably explains those terrified eight-year-olds). With one or two exceptions, we did not find ourselves disoriented. In general, the virtual simulation seemed to work better when we moved at a deliberate pace in a straight line and made sharp, right-angle turns to enter each new doorway. If we meandered at an oblique angle, the surroundings seemed to shift slightly, creating a vertiginous effect. The one time we felt woozy was when came too "close" to a virtual door jamb and reached out to steady ourselves - only to have our hand grasp empty air. Our only point of comparison for Ghost Manor is Halloween 2016's short-lived FearVR at the Knotts Berry Farm Halloween Haunt. FearVR was clearly aimed at an older audience, so its scares were more intense. However, its "motion" was entirely an illusion: participants were literally strapped in static chairs, and the VR simulated being pushed in a wheelchair. 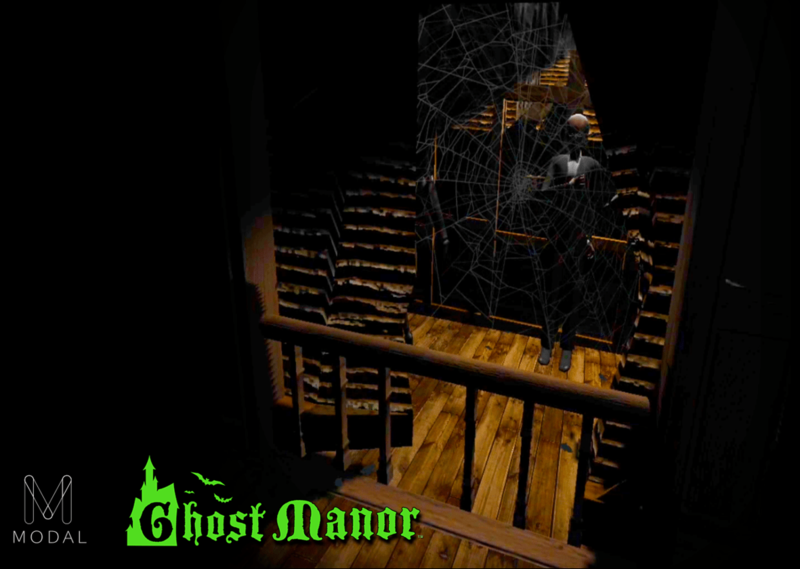 The advantage of Ghost Manor is that it allows participants to actually walk, look around, and pause long enough to feel as if they are exploring the virtual space at their leisure. We understand that Ghost Manor will be enhanced with a few physical effects during Castle Dark's hours of operation: participants will walk through clinging filaments when a giant spiderweb appears, and their feet will crunch on gravel in the outdoor section. To some extent, this year's Ghost Manor is a trial run, with plans to enhance and improve it for next year. One item on the agenda is to program multiple versions, which can be selected according to age-level: mild, medium, and spicy, depending on how scared people want to be. Hopefully, next year, the PKE meters will be at 11. Castle Dark's other Halloween attractions include three mazes (Castle Peak Caverns, Shiverton Keep, Carnival of "S"laughter) and a ride (Ghost Blasters in 3D - which we hear is worth the price of admission all on its own). Castle Park also offers Happy Hauntings on weekend afternoons, with Halloween activities for children 12 and under: costume contest, pumpkin painting, and amaze. Castle Dark runs October 6-7, 13-15, 20-22, 27-29; hours are 7-10pm on Fridays & Saturdays, 7-9 pm on Sundays. 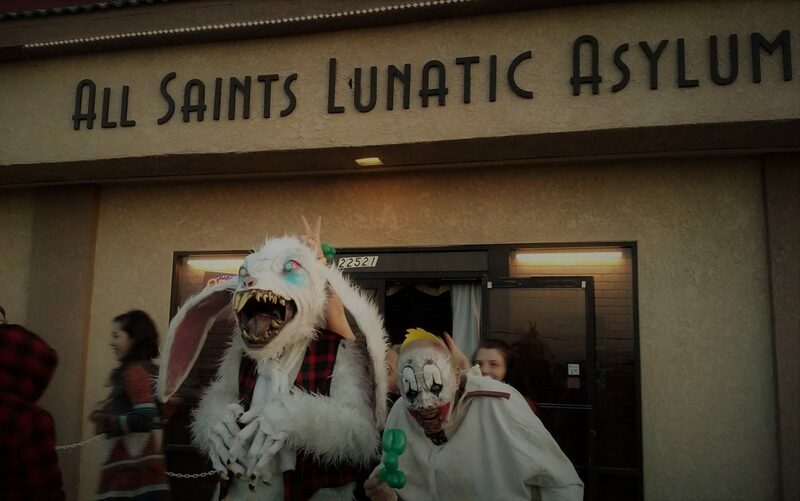 Happy Hauntings runs October 7 through 29: rides open at noon; kid-friendly Halloween Activities run 3-5pm. Castle Park is located at 3500 Polk Street in Riverside, 92505. The official website is: castlepark.com. This free-roaming virtual reality haunted attraction offers a creepy computer-generated environment with mostly mild scares and a climactic final shock. It should provide safe Halloween fun for all but the youngest and most timid viewers.